The second edition of the summer school on “Normativity and Reality of Human Rights” is jointly organised by the Department of Political Science, Law and International Studies (SPGI) and the Human Rights Centre “Antonio Papisca” of the University of Padova, and the Human Rights Consortium of the SAS at the University of London, and in cooperation with the School of Global Studies at the University of Gothenburg. The summer school continues on its task of critically addressing the interplay between norms and facts about human rights. This year, the focus will be on the impact on human rights of artifical intelligence and new technologies. The overall aim of the Summer School is to reflect on the challenges for human rights normative systems stemming from the variety of situations in which human rights are operationalised. The normative/factual fault lines, the chasm between law and reality, are investigated not only in terms of compliance gaps, but also as opportunities for expanding and attuning the legal, ethical and philosophical articulations of current human rights narratives. Methodologically, this implies interdisciplinarity, and a systematic back and forth from the global to the local dimensions, and from normative to empirical perspectives. The 2019 curriculum focuses on an area in which the interplay between the legal and the factual is especially relevant: Artificial Intelligence (AI) and the information and communications technologies (ICTs), and their actual and potential impact on human rights. Despite attempts by legislators and regulatory bodies to catch up with the technological innovations and bridge the gap between the normative framework and the off-line and on-line life of so many individuals, ICTs are still perceived as a disruptive intruder. AI is far from being incorporated in the normative (legal and moral) dimensions that frame the behaviour of human beings. And indeed, AI and ICT are changing socio-political and legal patterns not only in matters such as privacy and data protection, but also in an array of human rights-related fields, such as the freedom of the media, health and social assistance, political participation and social struggles, security and surveillance, non-discrimination, access to health care, humanitarian action. The aim of the School is to frame the issue by selecting some “situations of human rights vulnerability” in which challenges and opportunities of AI and ICTs can be investigated and assessed. The programme (40 hours – 6 ECTS credits) includes seminars, student-led workshops, film sessions, student presentations, and a general debate/round table. One session, sponsored by the “international Journal of Human Rights” (Taylor & Francis), is meant to provide participants with orientations on opportunities for research and publishing. They include: PhD candidates; master’s students and graduates, junior professionals and post-doc fellows. In the selection of participants, efforts are made to guarantee a diversity in gender, geo-cultural background, disciplines of study, and age. 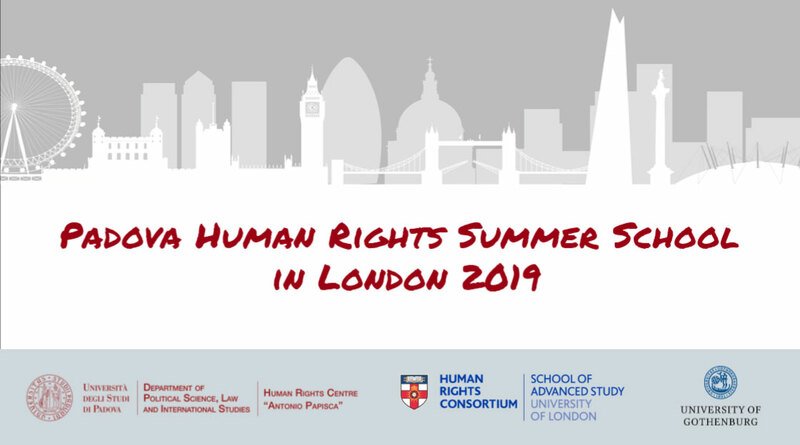 The Summer School is organised by the University of Padova, the Department of Political Science, Law and International Studies, and the School of Advanced Studies - the Human rights Consortium, at the University of London. Lectures and workshops are held by scholars from the universities of Antwerp, Gothenburg, Guangzhou, Graz, Vienna, London, and Padova. The programme features 40 hours of formal and non-formal learning, includes an assessment, and corresponds to 6 ECTS credits. A certificate can be produced at request. Admitted applicants shall finalise their enrolment by paying a registration fee of 100.00 euro. The impact of algorithms, automation and AI on human rights. AI and ICTs in governance. The Chinese way. AI and ICT-related litigations. Situations of HR vulnerability: social media. AI and ICT contribution in human rights monitoring. Situations of HR vulnerability: HR defenders.